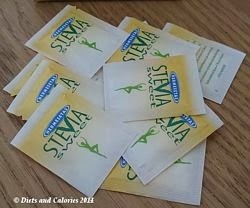 While browsing around my local health food store recently, I saw Hermesetas had a ‘new improved formula’ selection of their sweetener called SteviaSweet. I’ve purchased Hermesetas SteviaSweet Tablets before, but this time I opted to try out the sachets. Stevia is a natural and virtually calorie-free sugar substitute. It’s made by extracting the steviol glycosides from the Stevia leaf which is many times sweeter than sugar. Many of the well known artificial sweetener brands are now producing their own versions of sweeteners using stevia, including Hermesatas. Hermesetas produce SteviaSweet in sachets, liquid form, tablets and granulated sold in a 75g jar. The 50g box contains 50 sachets, each one with the equivalent sweetness to one teaspoon of sugar. They also have 1 calorie each. 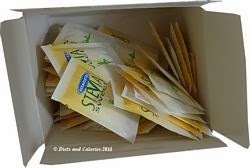 Interestingly, these stevia sweeteners have a 40% fibre content, although each sachet has just 0.4g. You’d need to get through a lot to reach a minimum of 20g a day! This is highly unlikely, but if you do, there is a warning that when consumed in excess, they can have a laxative effect. "Sweeten your day the natural way. Hermesetas SteviaSweet sachets allow you to sweeten hot or cold drinks, cereals desserts and yogurts. Each sachet contains only 1 calorie, Hermesetas SteviaSweet sachets give you the sweet flavour you like without having to watch what you eat." Because it’s in sprinkle form, I’ve only used it to sweeten foods, rather than drinks. It has a slightly crunchy texture – not powdery like Splenda or Canderel, but it’s much finer than regular caster sugar. As for the taste, I find it very sweet, but a different sort of sweetness to sugar. It’s hard to describe. It’s quite intense and I feel it’s going to take a little while to get used to. The ingredients are: fibre: modified starch (contains wheat), erythritol, sweetener: steviol glycosides. I purchased my pack from a local health food store. Hermesetas also produce a hybrid sweetener made with a combination of sucralose and stevia. See my review here. Nutrition information per sachet: 1 calorie, 0g protein, 0g fat, 0g saturates, 0.54g carbs, 0.4g fibre, 0mg sodium. For more information on Hermesetas sweeteners, visit their website here.